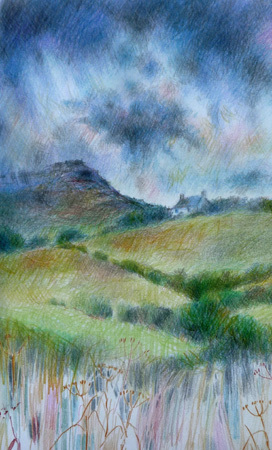 work in progress Penwith, on the Moor, Approaching Rain, Rembrant coloured pencils, about 12 inches tall. 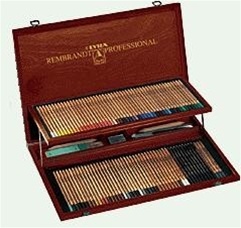 I've been using my lovely prize Rembrandts to check them out. I wouldn't normally use cp's alone to work on an image this size - I'd go into mixed media and use some watercolour to underpaint. That's partly because I like to work fast and partly because I like the wider variety of marks you can make by mixing media. It's looking a bit too fairy tale at the moment, not yet rugged enough. The foreground is obviously only just begun, lots more to do to that if I decide to finish it. 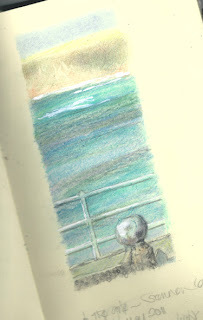 It may just stay an unfinished experiment in the sketchbook though. A hazy, windy day, forecast rain stayed away, the tide in so no beach to be seen but a seal swimming out in the surf kept popping up to look at us. I sat in a sheltered spot amongst the wildflowers on the cliff - just the sounds of the sea and the occasional gull - heaven. Even himself was quietly musing, no talking. It needs just a little work doing before I'll call it finished. 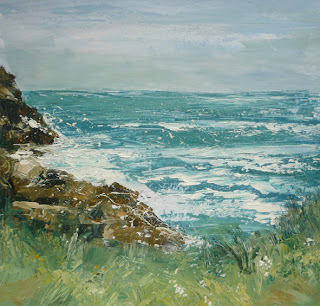 I often do just a little more when I get plein air works home - I'm looking at them as a painting then without distraction. 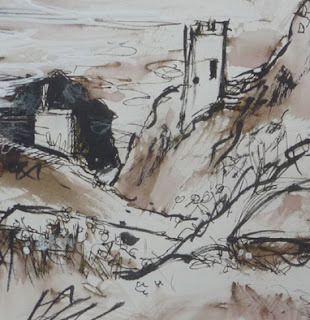 detail of the sketch below A quick sketch on a very windy day with Rotring pen and watersoluble ink, with a little brush pen (waterproof ink) and a touch of gouache. I do like watersoluble ink for those lovely washes. And turning 180 degrees this was the skyline, with another ruined mine engine house in the distance. This one was done in carbon pencil. I've had a few sessions of waiting for family while they attend appointments. 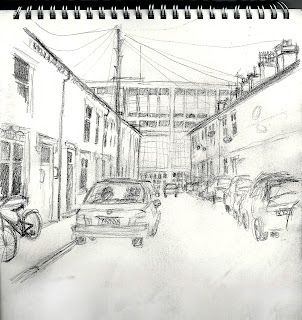 Rather than be bored I've taken to sketching from the car while I wait - good practice for perspective even if not an exciting drawing in itself. I think I'm going to keep this A4 wirebound sketchbook in the car for these times of boredom. ...... I'd entered something in the Artists and Illustrators magazine and this was the second prize :>) - what a surprise. 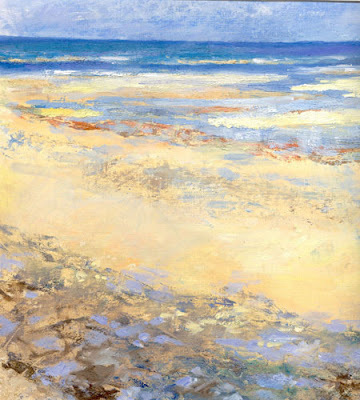 This one was an experiment with some foam rollers I'd bought at the weekend, working from a plein air sketch I'd done. Also an experiment with Bristol board (very smooth) as it's only the second time I've used it - the first was with oil paints in Cornwall. I swept the rollers over several colours that I wanted to appear in the trees and put them down with one line - it gave a wonderful speckled appearance that I later adjusted with glazes. I love these rollers! 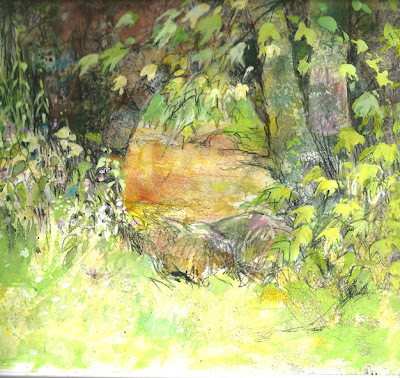 Then I used it to put background sweeps and areas of colour for the foliage, grasses and stonework, before working into them with brushes and watercolour, gouache, coloured pencil (a very little), oil pastel and charcoal pencil. They were extremely cheap and are going to become one of my favourite tools I think. I went to the Private View of this brilliant exhibition at the weekend and the painting above is the one that I would have loved to own. The trees glow in a shaft of light, rain approaches and the colour, marks and light express the weather and mood of the day perfectly. The reality is so much better than any tiny photograph can show. Some lucky person bought it as I stood talking to him about his work - no red dot at the beginning of the conversation - big red dot a few minutes later. His work was deservedly selling well. It's a lovely gallery with lots of space and shows the work of some very good artists, well worth repeat visits. 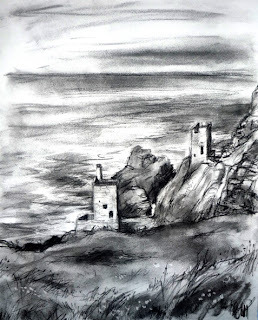 I was determined to sketch these old engine houses in charcoal on this visit - the wildness of the place, the old stone buildings - it just seems so much the right medium. 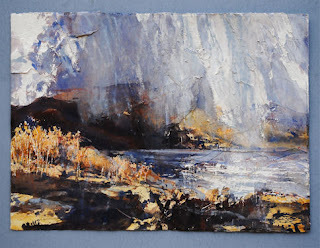 I'd like to do an A1 version of this - or if I've got a sheet of the larger Fabriano paper left, an even larger one. I do like charcoal. It's such a painterly medium for drawing, so easily adjustable - smudging out to pale soft washes or left intense and black, drawn back into with an eraser to 'draw' lights back in, like the flowers at the front. Endlessly pushaboutable! I need to get the larger oil and charcoal sketches photographed. 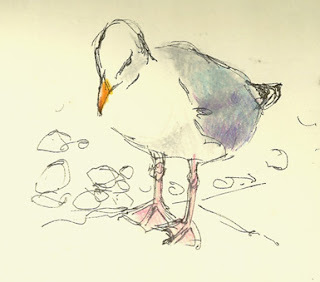 Just the sound of gulls instantly takes me back to my childhood in Cornwall. They seem the essence of freedom, gliding on the the wind, light shining through feathers. We'd been exploring up on the bleak high moors, which I love, small herds of wild ponies and sheep, stunted trees and rocky crags, narrow roads and ancient stone bridges. Now we were at the edge of the moor - lush wooded valleys, streams the colour of whisky tumbling over rocks on their way to the sea - equally lovely in a very very different way. 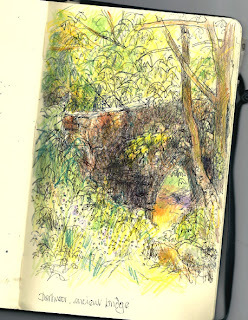 I stopped to catch the dappled sunlight on this old bridge and the warm amber glow of the peaty water. It was an incredible tangle of wildflowers and branches, great contrasts of light and dark and not at all easy! so it maybe got a bit overworked. 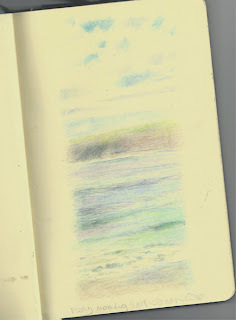 Two more colour/light studies of the view across the bay. A vivid blue afternoon and a pale pale morning (which was almost impossible to scan because it really is very pale). Another in the series that looks at the changing colours and light across the bay at different times. This one is very early in the morning looking north west ish. At that time the sun is slightly to the right and the cliffs are silhouetted, colours pearly pale, clouds burning off in the risen sun and the promise of another lovely day. 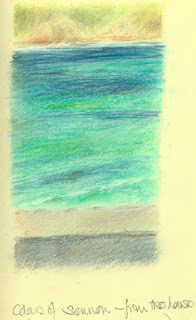 This is one of a series of colour studies of the bay at different times of day, recording the changing colours. This was the afternoon light - sunny, bringing out the intense turquoise/viridian/prussian blue in the water. Journal or sketchbook? what is the difference? What do you call your sketchbooks - journals? or sketchbooks? For me they are definitely sketch books, gathering and recording information and working through ideas. Some rough and quick, some much more 'finished'. Even though I do often write in them about the day, the light, the history or interesting facts that add to the feel of the place and the memories for me. (not to mention shopping lists of art materials, artists quotes, information on exhibitions, things stuck in and lots more) They are a resource to draw on in the future. Sometimes I take work out and frame it - that happened to the one above. If I remove it, then I do a scan and put a print in its place so the information and link to the work before and after isn't lost. Usually it remains in the sketchbook though. 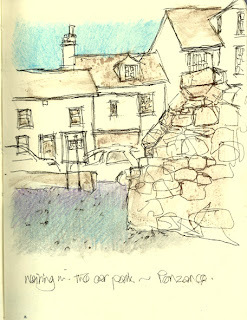 Some make journals with text and image beautifully balanced - it's an ongoing diary, a stream of consciousness.